Built by Suryavarman II (1113-1150) as his capital, Angkor Wat is a moated city (the city buildings have long since disappeared) that is centered on his State Temple. The temple is oriented to the west, an unusual direction that most authors ascribe to its dedication to Vishnu. This can't be the whole story, though, because most temples in Southeast Asia, with only a few exceptions, face east, regardless of their dedications. Most likely the explanation in this case is astronomical; Angkor Wat's western gopura brackets the rising sun's position between the summer and winter solstices (Mannikka, pp. 37-42). 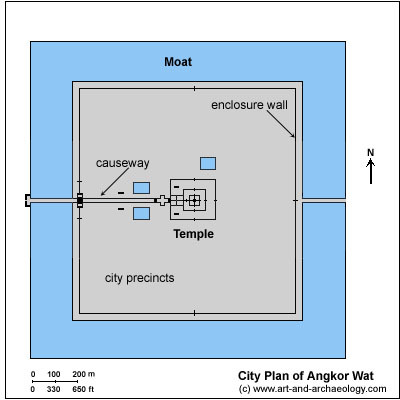 The outer dimensions of the city, excluding the moat, are 1025m by 802m (.6mi x .5mi); the temple's outer wall measures 332m x 258m (1100' x 850') (Freeman and Jacques, p.47). The temple itself is approached by a long causeway which terminates in a cruciform platform (naga bridge). From thence it ascends in three levels to a quincunx of towers. Only the five central towers remain, the others (at the corners of each enclosure) having collapsed. Bridging the third and second enclosures on the western axis is a unique structure, the so-called cruciform cloister, which replicates in plan the temple's third level platform. The third (outer) enclosure of the temple is a cloister that faces outwards. Its sandstone walls - over a third of a mile in total length, and about six feet high - are carved with bas-reliefs that depict Cambodian mythology and history. Most date from the time of Suryavarman, but the reliefs on the northeast corner (Krishna defeats Bana, and Vishnu defeats Asuras) date from a mid-16th century reoccupation of Angkor by king Ang Chan. The reliefs may originally have been painted, but any color remaining today is from a later time. The general theme of the bas-reliefs, as can be seen from the temple plan above, is the triumph of good - represented by Vishnu and his avatars, especially Krishna - over evil. Because Suryavarman could be regarded symbolically as an avatar, or at least an earthly representative of Vishnu, such a scheme seems appropriate to celebrate Suryavarman's reign. 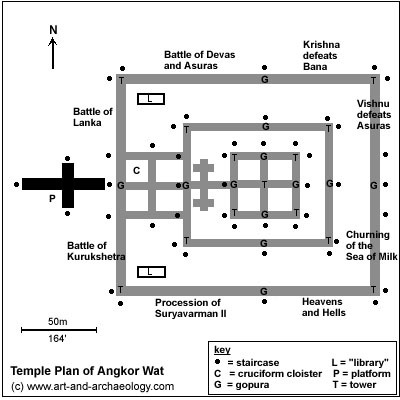 Further, as Mannikka (p.177) points out, the Battle of Lanka and the Battle of Devas and Asuras may have symbolized actual historical battles in which Suryavarman took part. The specific arrangement of the reliefs has been a matter of some debate. For one thing, their placement suggests a counterclockwise rather than the more usual clockwise circumambulation; the order of subjects is also difficult to understand. Recently, Eleanor Mannikka (pp.125 ff.) has found astronomical significance in this arrangement: the spring equinox happens in the east and corresponds to the Churning (beginning of things), the summer solistice in the north (Mt. Meru, Battle of Asuras and Devas), the autumn equinox in the west (end of things, Battle of Kurukshetra), and the winter solistice in the south (realm of Yama, Heavens and Hells). While not all of Mannikka's proposals have been accepted in detail, it does seem that astronomy was a significant consideration in planning the temple (Coe, pp.120-121).